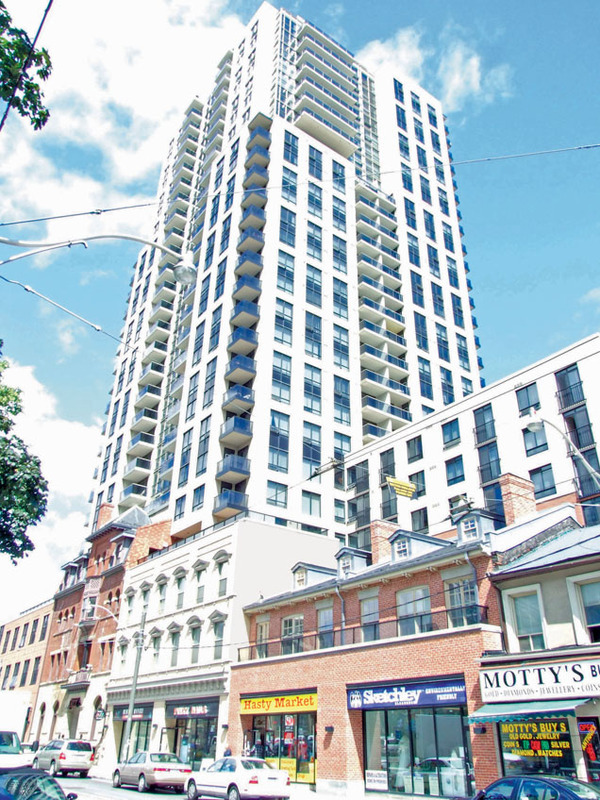 This twenty-nine storey rental apartment tower, over a seven storey podium block, is located on the east side of Church Street, south of Shuter Street in downtown Toronto. The entire project is built over four levels of subgrade parking. It also involved the reconstruction of one, two storey historical facade and the supporting, both temporarily and permanently, of another four storey historical facade. The later involved a special caisson wall and a temporary system of vertical trusses, so as not to lose any parking spaces below the facade wall. The walls and columns are founded on strip and spread footings, respectively, which bear on soils with bearing capacities of 400, 600 and 1000 kilopascals, (ie. 8,352, 12,528 and 20,880 pounds or 4.18, 6.26 and 10.44 tons per square foot). The subgrade parking level slabs are typically 210 mm thick reinforced concrete flat slabs with 150 mm deep drop panels, over the columns, cast with a concrete with a strength of 35 megapascals, at twenty-eight days, satisfying class “C-1” requirements. The ground floor is framed in a manner similar to the parking level slabs. The second floor is primarily a series of 200 mm thick, one-way reinforced concrete slabs, supported on transfer beams, introduced over the ground floor columns, to support the shear walls above the second floor. The third through to the seventh floors of the podium block, have primarily 200 mm thick one-way reinforced concrete slabs, spanning between reinforced concrete shear walls, except at the north two bays where the slabs are 200 mm thick reinforced concrete flat plates. The tower slabs begin at the eighth floor and continue with the shear walls up to the underside of the twenty-ninth floor, mechanical level, and low roof. At the north and south ends of the podium, beyond the tower, the podium roofs are terraces with green landscaping. The typical floors, in the tower, are 200 mm thick one-way reinforced concrete slabs, spanning between reinforced concrete shear walls, which are typically 250 mm thick up to the twelfth floor, and 200 mm thick above, up to the twenty-ninth level. Lateral forces resulting from wind or seismic effects are resisted by the interaction of the shear walls with the central core, which contains two elevator shafts, and scissor stairs. The mechanical room slab, at the twenty-ninth floor level, is 300 mm thick. At the perimeter of the roof, at this level, there is a series of davit base supports, cast monolithically with the perimeter roof surrounding the mechanical penthouse. The elevator machine room floor is at the level of the mechanical penthouse, and is designed as a two-way, 200 mm thick, reinforced concrete slab. The walls of the elevator machine room are 250 mm thick reinforced concrete and support the one-way reinforced concrete roof slab with a varying thickness of 200 mm to 300 mm.